Saves money and "scrounge-time" by putting all the most needed swivel stud parts at your fingertips. Uncle Mike's is the most popular brand on the market, so you'll have what most of your customer's guns need. SPECS: Kit includes: 1 dz. 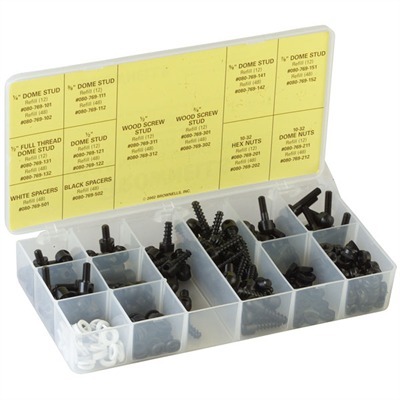 each of 6 individual 10-32, dome-top sling studs; 3 dz., ¾" (19mm) wood screw studs; 1 dz., ½" (12.7mm) wood screw studs; 2 dz., 10-32 hex nuts; 4 dz., 10-32 dome top nuts; 4 dz. white plastic spacers; 4 dz., black plastic spacers; all in bench box. Order refills from chart.